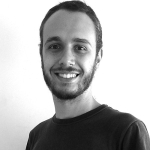 Rafael Moraes graduated as an Architect and Urban Planner from University FUMEC in 2012, in Belo Horizonte and has been part of WSDG team in Brazil since 2010. Rafael has worked in several different areas of architecture modeling and presentation, urban planning and executive projects and has recently been managing some of the recent projects in the Brazillian office. Rafael is also a teacher lecturing Revit and computer modeling design. As a hobby, Rafael has been practicing his music skills as a teacher and player of bass guitar and acoustic guitar.